1. Are there any dress regulations for the Phuket golf clubs ? Men : Golf shoes, socks, tailored pants/Bermudas, collared polo or sports/golfing t-shirt. Ladies : Golf shoes, socks, tailored Bermudas/pants/skirt, blouse/collared polo or sports/golfing t-shirt. Non-golfers accompanying a golfer: Dress code requirements are same as the golfer. 2. Are caddies compulsory, even if I take a cart ? Yes! Caddies are required at every course. 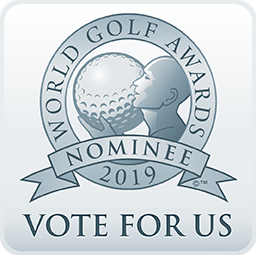 They will carry your golf clubs, assist you with club selection, repair divots, rake bunkers explain the lie of the land and help finding any lost balls. The caddy fee is currently 300 – 400 baht/caddy/18 holes at all of Phukets golf courses. The caddy fee does NOT include a caddy tip. An appropriate caddy tip is generally 300 – 400 baht/18 holes. The golf clubs display their recommended tip in the clubhouse or pro shop. You can hire more than 1 caddy if you wish to have one holding your umbrella. 3. Can I take my own food or drinks to the golf club ? No! Every Phuket golf club has excellent food and drink facilities in the club house and around the golf course. Phuket is a tropical island and can get quite hot and humid at times. Be sure to drink plenty of water before, duringand after your game to minimize dehydration. 4. Are there changing rooms with showers at Phukets golf courses ? Yes! All of the golf courses have excellent locker room facilities. There’s nothing nicer than a refreshing shower after a game of golf. 5. Do all of Phukets golf clubs have carts ? 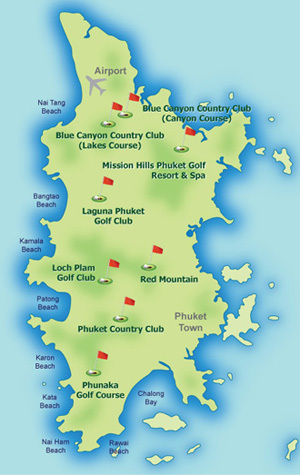 Phuket Country Club & (Phunaka 9 hole course) : No carts! Walking only ! Red Mountain, Blue Canyon Lakes and Mission Hills have compulsory individual carts. Loch Palm, Laguna and Blue Canyon-Canyon courses have individual carts available, or you can walk if you wish. 6. Can I rent or purchase shoes and golf clubs at the golf club ? Yes! All of the golf clubs have an excellent range of equipment for rent/sale in their pro shops. 7. Can my family and friends accompany me on the golf course ? Yes! However there is usually a fee for those non-golfers. They are also expected to conform to the golf clubs dress code (same as the golfers). 8. Do I need a handicap card to play ? No! However players are expected to have a basic knowledge of golf and golf etiquette. Slow play is not allowed as it holds up the field. 9. Can I share my golf clubs with another player ? No! The golf clubs all insist on one set of clubs per player. If necessary, clubs can be hired from the pro shop. 10. Will the golf club assist in finding another golfer for me to join ? Yes! Just ask the ‘Starter’ before you tee off if you can play with another golfer, or when you make your golf booking ask us to assist. We will make the request to the ‘Starter’ for you. 11. Can a five-ball play together ? Sometimes the golf club will allow a five ball flight, but it all depends on numbers of golfers playing that day. Four ball flights are the standard. 12. Can I get a refund if its raining ? If the golf club is closed due to rain they will give you a raincheck and allow you to play another day. As a general rule if the golf course is open, you have started playing but have played less than 9 holes they will give you a rain check for 9 holes, (you will still have to pay for your caddy, equipment rental and transfers). If you have played more than 9 holes, no rain check will be issued. 13. Can I get a refund if I have to cancel my game ? You will be offered an alternative day/tee off time proving you have given more than 24 hours notice of cancellation. 14. Can I get a discount from the golf club if I show my authorized PGA membership card ? Each of Phukets golf clubs have different regulations regarding international PGA membership. Advise us when you make your booking and we will check with the specific golf course. Don’t forget to bring your PGA membership card. 15. Is there any advantage in booking my accommodation through you ? YES, ABSOLUTELY! We have been working with a range of very popular hotels, resorts and villas for our golfing customers for over eight years. Most times our prices are better than you will find elsewhere. 16. How do I make a booking ? You can book your golf using our internet booking service or just call us on one of the phone numbers displayed at the top of the page. To book on our internet booking service just click on the golf course you wish to play and complete the booking details. Your booking will be confirmed within 24 hours. Green fee only : Our staff will meet you at the golf course and collect payment for the green fee. Our staff will assist you to check in at the pro shop. Blue Canyon require payment 24 hours in advance. We can send you a secure bank link for credit card payment of Blue Canyons green fees. Golf package : Please pay our driver when he collects you from your hotel or villa. We accept cash, Visa or MC. (No bank fees).